scheisse! 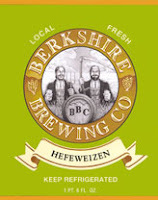 BBC's Hefeweizen tastes like an authentic German Wheat Beer! If you like German Wheats, then you will love this beer. It's not a watered down, filtered version, rather it has all the same properties as if you were in the Paulaner Keller in Muenchen (Munich). These guys go it right! Sam Koch needs to take a lesson from these guys on how to make a wheat beer!